The VMC Heavy Duty Wide Gap Worm hook is suitable for Braided and Heavy Monofilament Line. This Hook has a 3 degree offset point and works best for heavy cover rigs. 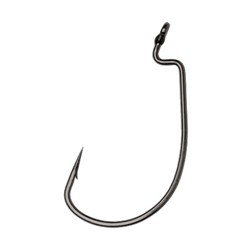 The Heavy Duty Wide Gap Hook is Black Nickel and features a Resin Closed Eye.